I was surprised to see White Horse, a 28 ft. Satawalese traditionally-made sailing canoe undergoing repairs on Yap. 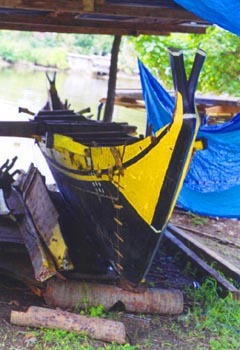 It had been purchased by a hotel on Yap and was being restored to give rides to tourists in Colonia Bay. I had gone fishing on this magnificent vessel when it visited Lamotrek Atoll in 1987. The wooden pegs used to tighten the new lashings can be seen between the planks of the bow section and the hull and also below the gunnel. It is not uncommon for sailing canoes to be overhauled again and again for up to 30 years.